10:00 am to 5:00 pm Click here for Hours of Operation! Disney’s Blizzard Beach Water Park, located in Orlando Florida is a diverse and unique water park unlike any other in the country. Don’t be fooled by this ski-themed park, as this is not ski resort! The story begins with a freak snow storm that covers Florida.Floridians began building ski resorts with slalom courses, toboggan slides and walkways made of icebergs. Then just as fast as the snow fell, the weather changes back to the normal, sunny Florida weather we all enjoy. The just built ski resort hastily melts. Now what? The townspeople looked at each other confused. An energetic alligator with an idea, saw a great opportunity for some continued fun. Wearing a scarf and hat, the alligator slid down the snowless ski jump and splashed into the a pool of melted snow. At that very magical moment, a Disney’s Blizzard Water Park was born. Disney’s Blizzard Water Park equipped with a little bit for everyone including relaxing raft rides, toboggan rides, a 1 acre wave pool, Tike’s Peak children’s play area and exhilarating water slides. Including on of the tallest and fastest slides in America, Summit Plummet! You will travel on your back down the 360 foot long track at 55 mph and fall from a staggering 120 feet. Walt Disney created this magical park where kids can frolic and play and adults can find their inner child. Relax and enjoy this unique park for an exhilarating time, Disney style. Disney Water Park Annual Passes are also available @ $130.00 Click here to view pass benefits and other pass options. Get the latest Disney Parks news and special offers by signing up here!!! 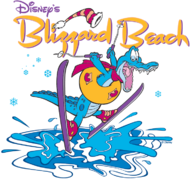 Note to our visitors: coupons and specials at Disney's Blizzard Beach can change without notice. So please visit their official website to make sure of the latest pricing and coupons.